We have a love and fear relationship with Mars. It’s touchdown again on Mars, with NASA’s InSight probe having landed yesterday. This latest mission will continue our exploration of much that is still unknown about the planet. As seen from Earth, the big red dot in the night sky has certainly caught the attention of humans since we started contemplating the universe. The first observations with telescopes gave us a much clearer picture of Mars, with the poles covered in ice and different tones of red and black in the tropics. NASA’s InSight (Interior Exploration using Seismic Investigations, Geodesy and Heat Transport) mission should tell us more about the interior of Mars and how the planet formed. Perhaps the most curious account of Mars came from the Italian astronomer Giovanni Schiaparelli in 1877. He observed a dense network of linear structures on the surface of Mars which he called “canali” in Italian, meaning “channels”. 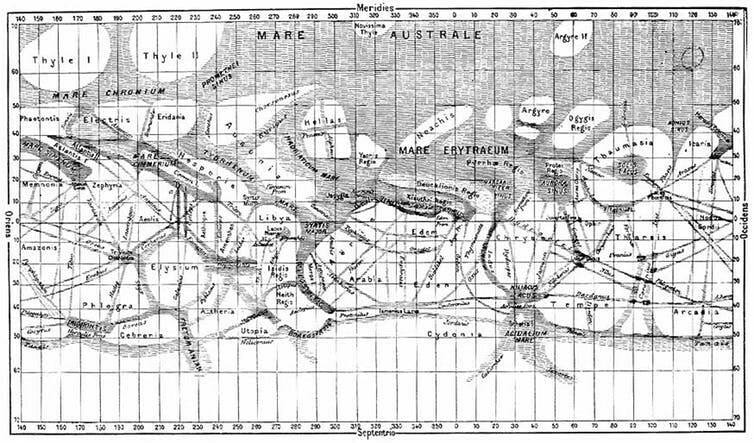 But the term was misinterpreted by some English-speakers as “canals”, which implied they were made by Martians. Our love and fear relationship with Mars escalated to another level in 1938, when Orson Welles broadcast an all-too-real adaption of HG Wells’ classic The War of the Worlds. The Halloween night broadcast of the invasion of Martians to Earth apparently lead some listeners in the United States to panic, as they took the fiction as a fact (a story told in the 1975 movie, The Night That Panicked America). How much panic is still open to question. HG Wells’ 1898 novel has inspired more than a few Hollywood movies, television series and a musical telling since then, including Steven Spielberg’s 2005 movie War of the Worlds. The first close-up images from Mars came in 1965 with the Mariner 4 spacecraft flying by the planet, and then with Mariner 9 entering orbit in 1971. Both spacecraft showed Mars as a cold, barren, desert-like world. Before these missions we had only seen Mars through telescopes, and the question of whether the planet was habitable (or inhabited) was still open. I still remember when I was a child watching a TV program showing images of the Viking mission which landed two probes on Mars in 1976. 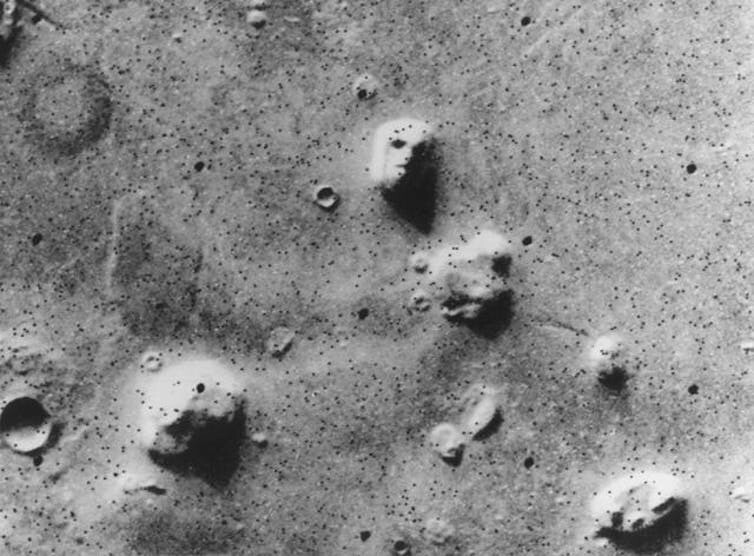 Instead of talking about our first successful spacecraft to land on Mars and sending us images and scientific data from the surface of another planet, the program talked for a long time about a feature that looked like a face of a man on the surface of Mars, and structures that resembled pyramids. Those images certainly affected me, and were key in my fascination for Mars and space in general. The legacy of the Viking landers was mostly their first geochemical characterisation from the surface, and a detailed atmospheric composition analysis from Mars. Viking results were fantastic in many ways, but disappointing too as they indicated a dry planet, full of primary rocks that would have transformed into minerals if water was present. Pictures from the surface showed no signs of life – no signs of little bushes, a bit of moss on some rocks, or a green man smiling to the cameras. In a way we lost our interest for Mars until it attacked us with meteorites. Rocks from planets and the Moon, and meteors, hold chemical hints of where they came from. So it’s possible to tell if a meteorite is from our Moon, from Mars, or from elsewhere. A meteorite found in Antarctica (dubbed ALH84001) is one that scientists affirm came from Mars. Martian meteorites can be found on Earth because a big meteorite probably fell on Mars, and in the process ended up ejecting pieces of the surface into space. Some were big enough to enter our atmosphere and be found later. 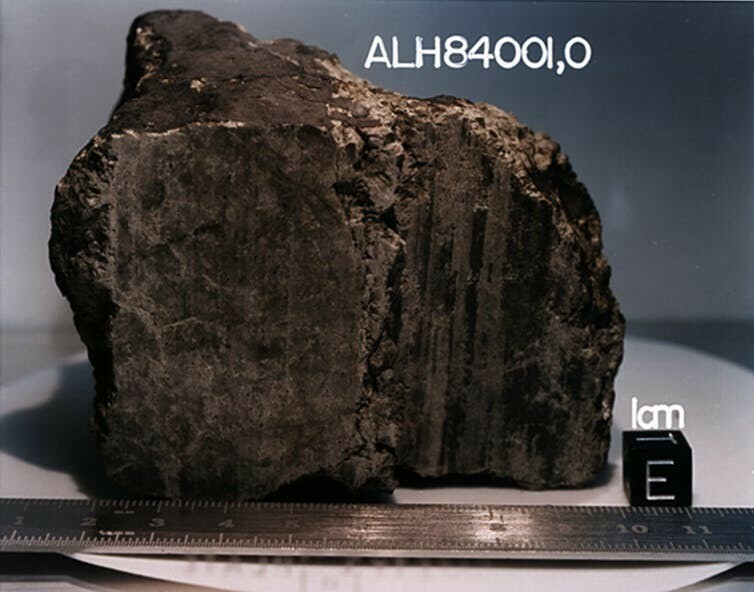 ALH84001 is made mostly of carbonate: a mineral that needs water to be formed. Therefore, indirectly we can conclude that Mars was once wet. 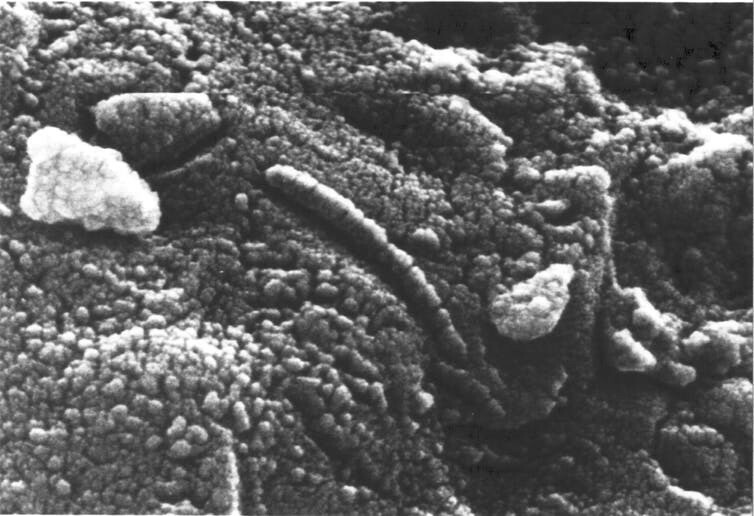 To make it even more interesting, this Martian postcard has some miniscule structures that look like some bacteria found on Earth. 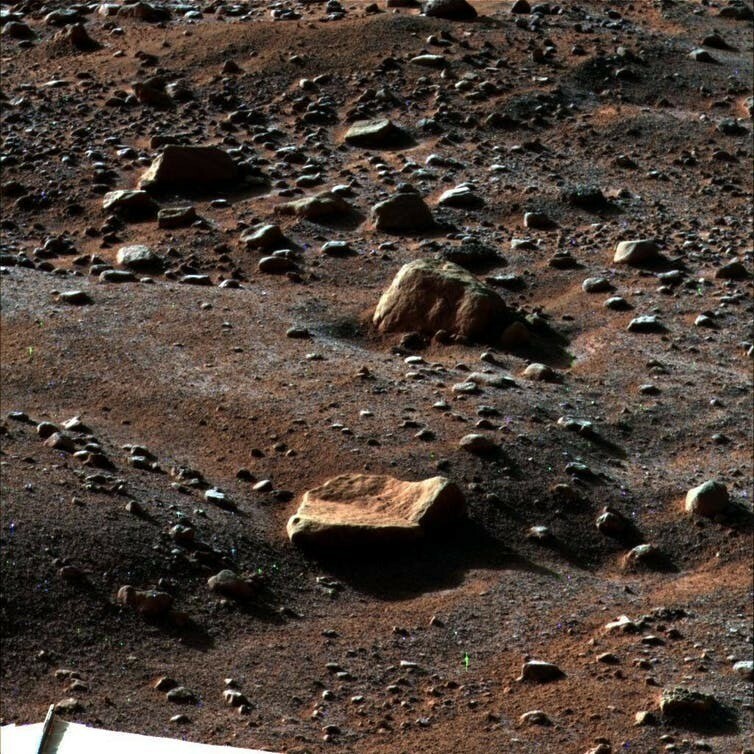 Scientists are still debating whether those structures are Martian fossils or not. But the discovery and analysis of ALH84001 brought us back to Mars. Now it was time for us to counterattack. NASA then announced the first rover mission to Mars called Pathfinder. The microwave oven sized rover it carried, called Sojourner, landed on Mars in 1997. Take a look around on Mars. The rover produced results quite similar to those found by Viking, pointing to a very dry past and present on Mars. What followed was a considerable effort to get more images of the Martian surface from orbiters, and select the place to land with future payloads. 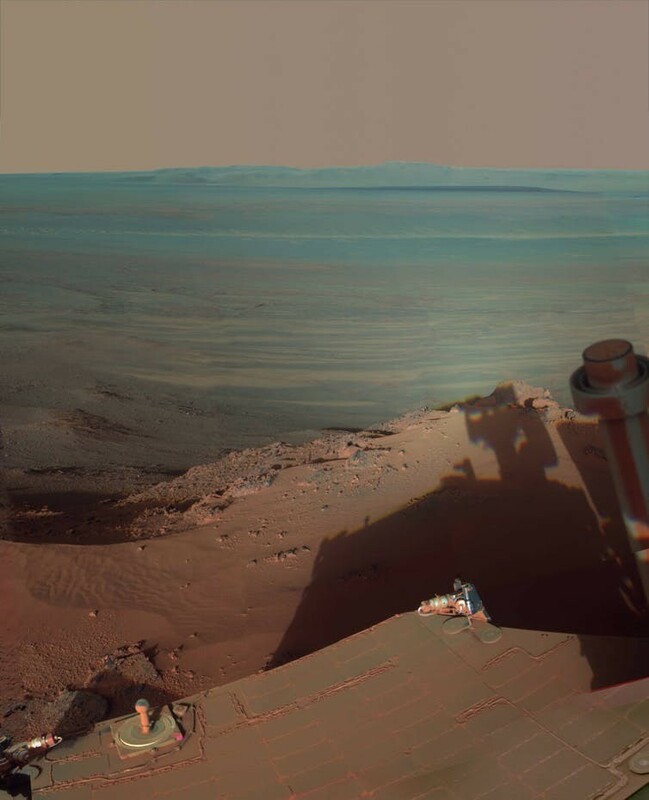 After debating more than 174 potential landing sites, scientists and engineers involved with Mars research discussed and they to two places to land on Mars with two large rovers: Spirit and Opportunity. After seven months of interplanetary travel, the rovers landed in January 2004. The initial results obtained by Spirit were similar to those from Viking and Mars Pathfinder. The first groundbreaking results came from Opportunity with the discovery of jarosite and hematite: two minerals that need water and acidic conditions to be formed. After working way beyond their manufacture warranty (three months), the twin rovers transformed our knowledge about the past of Mars. Before we landed there was the question of whether Mars was once wet. Now we know that there were once oceans on Mars as salty as the Dead Sea, plus there were hot springs and fresh water streams. Water on Mars was not only present, but it was there in different forms. Mars had perfect conditions for long enough for life to form and evolve. At least we can say Mars was habitable. Spirit was active for six years and Opportunity, after 15 years, is still officially going on. 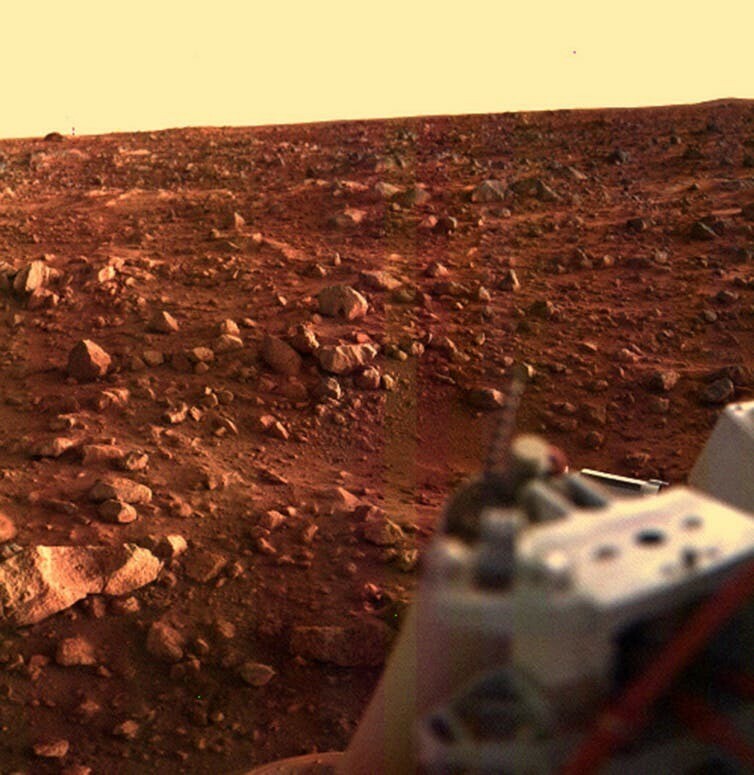 During this time a lander called Phoenix landed in the Green Valley of Castitas Borealis on the Martian northern hemisphere, near the north pole. The key discovery from Phoenix was the presence of minute concentrations of perchlorate, a powerful bacterial killer salt. Despite the impact these missions have in our understanding about Mars, there were a number of instruments we would love to use and could not fit in a rover. The idea of having a fully equipped Martian laboratory fuelled scientists to propose a new mission: Mars Science Laboratory with a much larger rover. It’s equipped with laser beams able to analyse rocks at distance, rock grinders and analysers able to provide a more detailed characterisation of Mars rocks, soil and atmosphere. Perchlorates were also found by the Curiosity rover, from the Mars Science Laboratory mission, and also on a Martian meteorite called EETA79001 which suggest a global distribution of these bacterial-killer salts. The past 50 years were full of discoveries about Mars’s surface, but little is known about its subsoil or inner core. This is where the InSight mission that is about to land on Mars comes in to play. It’s supported by NASA’s Deep Space Network, including our station in Canberra which is managed on NASA’s behalf by CSIRO. InSight’s team hopes to learn how the deep interior of Mars was formed, and how similar they would be to other rocky worlds such as Venus, Mercury, our Moon, Earth, or those exoplanets from other solar systems. This is the first mission that is designed to investigate deep inside of Mars. Insight has a seismometer and temperature probe as part of its payload. The future will be dominated by sample return missions: those spacecraft able to land on Mars and bring samples back to Earth (similar to what Russians did on the Moon) and by our effort to have astronauts exploring Mars on their own feet. The quest for understanding the evolution of our Solar System continues and I am still confronted by a large number of questions without an answer. Hopefully InSight will provide some of those answers but there is still much to learn about what lies above us on Mars, the fourth planet out from the Sun.